In April 2010 I attended the Portrait Society of America annual conference in Reston, VA, which was a stimulating four days learning from established artists of all ages. Rose Frantzen won the Face-Off portrait event and on Saturday morning when she gave her presentation she shared with the audience that she had completed (12) 1-1/2 hour practice sessions to get ready for the conference. This impressed me and made me realize that no matter how established or accomplished you may be in your profession, practicing is a good way to prepare and prosper in most situations. With this experience in mind, and the positive results of having "words" embody my 2010 professional goals, I have decided to select two new words for 2011. Maintaining a consistent level of my craft while also striving for a greater depth of understanding of the techniques and ideas I encounter in my art career is my goal and why I chose these two words. 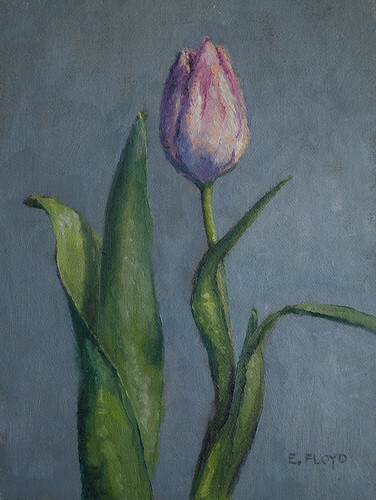 This first painting of the year is an example of both these words, in that I am interested in growing as an artist by beginning to apply the skills I've been gaining from copying Jan Davidsz de Heem's Vase of Flowers at the NGA. It is my intent to begin applying the experience learned from this to my own compositions.